Observers with hindsight says Tambuwal is fighting against a straw. As one of the former of the ruling party, who decamped to the opposition, he cannot be an umpire, because he is tainted like his other colleagues in the opposition, who are hellbent at wresting power from the incumbent for selfish reasons, but using the protection of the interest of Nigerians as camouflage. Nigerians know that no politician has their back. They know that Tambuwal is fighting to save Jega to ensure his party, the All People Congress, APC, has its way. For Tambuwal to threaten that removal of Jega from office will return Nigeria into the dark days is like telling the world that there has been a time Nigeria has it without darkness. This begs for Tambuwal's sense of history. Nigerians know that their country never has a good time that politicians do the bidding of the electorates. The politicians use the electorates to access power, and as soon as they settle down in office, they kick away the electorates and begin their business of pursuing personal interests. As a Nigerian, I am careless to whatever happen to the Nigerian democracy, because the Nigerian politicians' democracy does not serve my purpose. Nigerian politicians serve themselves and not the country or the people. It is why it is sad that a man of Jega's position who is supposed to be an umpire is reported to have become partisan and there are calls for his removal. Jega has not repudiated the allegations against him that he met with certain Emirs toward ensuring a Northerner is returned as president. And that towards this end, voters cards have been manifestly supplied to areas that will favor plans to return a Northerner in favor of the opposition party. It is this that makes it pertinent that Jega must go and he ought to have gone to save us the headache of unnecessary debate of his problems. The role played by Tambuwal on Tuesday in trying to ensure Jega remains to conclude their evil plans that will make General Olusegun Obasanjo and Bola Tinubu presidents from their homes and General Muhammed Buhari as a figure head is better truncated than be the democracy Nigerians yearn for. What new program does Obasanjo wants foist on Nigeria that he could not in his eight years as president? Tinubu knows he does not possess the integrity Nigerians require for a president or Vice President, because he has chosen to pursue inordinate wealth at the expense of higher political office, so he thinks he can come from back door for what he cannot openly ask. What Tambuwal did on Tuesday was playing the game to please his new masters. 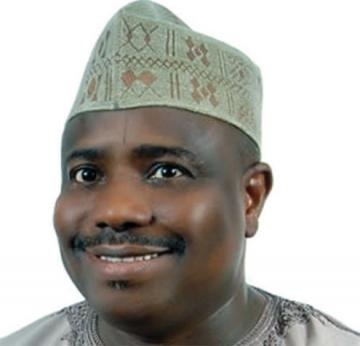 Tambuwal cannot scare Nigerians with a return of dark days. We are used to it. What Nigerians are scared of right now is the light Tambuwal and his masters are promising to bring Nigerians. Let Tambuwal publish the entire income and allowances of members of the House at the return of democracy in 1999 and now, and that will show the world what the House of Representatives in Nigeria has been doing, rather than protect the interests of Nigerians. If Tambuwal doesn't know, he should be told that he is a Speaker of House of Demons and Money Gobblers mistakenly called Nigerian House of Representatives. And by the way, does defection in a political arrangement suggests a sense of discipline or indiscipline? Isn't the defection of the Speaker and his other colleagues from their party to the opposition the foundation of the current trouble in the Nigerian political firmament? Observers say it is not Jega's likely removal that currently poses trouble for the Nigerian democracy, but his continuity in office, and people are saying President Jonathan has not acted to remove what is considered as a poison to the country's democracy.